Poetry Out Loud is a national poetry recitation competition for high school students. All Nebraska high schools are invited to participate each year in this exciting educational program. 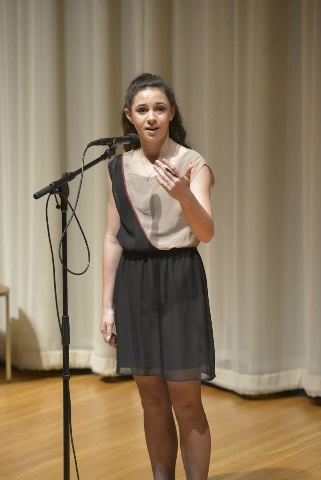 Nebraska's 2015 Poetry Out Loud ten year anniversary celebration concluded at state finals, held March 14th at the Sheldon Museum of Art in Lincoln. Following a stellar array of student recitations, a sophomore from Skutt Catholic High School, Amanda Pohlman, was named state champ for a second consecutive year. The 2015 first runner-up is Emma Sawyer from Burwell High School and second runner-up is Hannah Rembert from Cedar Catholic High School. Nebraska's state champ will compete with students from all fifty states at National Finals in Washington, D.C. April 28-29.